If you were seriously injured in a slip and fall accident in the Keys, then it makes sense that you would want to hire the best Florida Keys slip and fall accident lawyer you can find. In a perfect world, responsible people and insurance companies would step up and pay for the damages caused – but that is rarely the case. That is why you should identify the best Florida Keys personal injury lawyer after your slip and fall accident. At the Wolfson Law Firm, our Florida Keys slip and fall lawyers have helped slip and fall accident victims since 1963. We are ready and available to help you and your family as well. Just call us for your confidential and free consultation at (305) 285-1115 and let us help you understand your options after your slip and fall accident in the Florida Keys. The fact is that thousands of people every year get injured because of a slip and fall accident, sometimes very seriously. There are so many reasons as to why a person could slip and fall in a location including uneven ground, slippery surfaces, and flooring that is not properly secured. These are all things that should be properly kept up by the owner of the property otherwise it puts any visitors at risk for injury. Injuries can be very costly for victims and their families, so finding a quick resolution is crucial. Accidents that lead to injuries can seriously impact a family’s financial stability, especially if the person who was injured was the primary earner for the family. Injuries can prevent people from going to work every day and their may be medical expenses that are piling up that can add to this financial strain. Some injuries, if serious enough, could even keep a person out of work for a long time. You have enough to worry about during times like these, so it can be important to know that you have a Florida Keys accident attorney on your side, fighting for your rights as a victim. 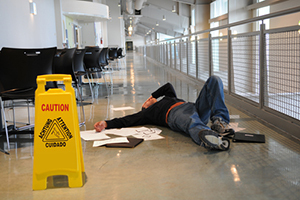 After a slip and fall accident has taken place, it is important to know what your rights are in those moments. The experience that we have as a Florida Keys accident attorney helps us to better understand how to help you learn what your rights are and work towards getting you complete compensation for your pain and damages. It can be an overwhelming and stressful process to go through if you do not have the right person working as your Florida Keys personal injury attorney. One of the biggest issues is liability – that is the issue of who was negligent. You need to figure out liability before you can even move forward, which is something that we, as Florida Keys personal injury lawyers, are here to help with. We will listen to what happened and help you understand what the next steps are. If the property owner was negligent and this led to your slip and fall accident, we can help your case move forward because you are likely entitled to compensation. The next steps are to figure out just how much your claim is worth. We take a close look at all the factors that are a part of your claim to see just how much you deserve for compensation. This includes not only paying for your medical expenses but also getting you compensation for lost wages as well as pain and suffering because of your injury. At the Wolfson Law Firm, our Florida Keys personal injury attorneys are here to help you after any type of slip and fall accident anywhere in the Florida Keys. Call us anytime at (305) 285-1115 for your free consultation. We look forward to working with you to achieve the justice and compensation that you are entitled to after your Florida Keys slip and fall accident and injury.